Edvantage offers great rewards and discounts to education employees and their families through partnerships with retailers and businesses throughout Ontario. OTIP administers Edvantage on behalf of your teachers' federation. Through continued support from our partners, Edvantage is able to offer great discounts, special offers and contests to you, our valued members. Examples of Edvantage partners are: GoodLife Fitness, Roots, Park ‘N Fly, Flight Centre, VIA Rail and many more. Visit www.edvantage.ca/OSSTF to see a full list of Edvantage partners and subscribe to e-News, Edvantage’s electronic newsletter today! You must log in to www.edvantage.ca/OSSTF with your Edvantage member information to access the deals from each partner. Look for the “How to take Edvantage” section on the partner page for more information on how to access the deals. You can also contact each partner directly with questions about their products, services or discounts. Your card serves a dual purpose as your federation card and your Edvantage membership card. Partners require your Edvantage number (X digit number located on your card) as well as the name of your association, in order to administer the discount. ​How do I find out my Edvantage number? If you do not have your card showing your Edvantage number, please contact your federation to confirm your number and have a new card issued to you, if required. Subscribe to our monthly electronic newsletter, Edvantage e-News, for the newest specials, contests and offers. 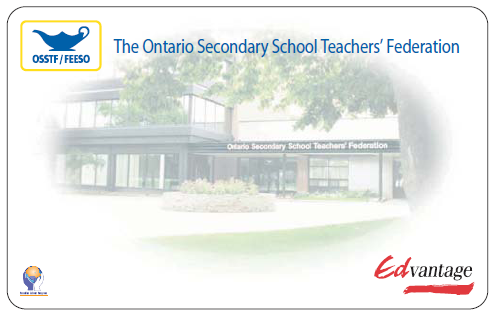 To subscribe, visit www.edvantage.ca/OSSTF and click the e-News link in the top menu. You will have the option to enter your e-mail address to start receiving the e-newsletter.